If you told me earlier this year that in the midst of two next-gen console launching, my favorite game of the fall was going to be from Nintendo, I would have called you insane. This is the game that the WiiU should have launched with. 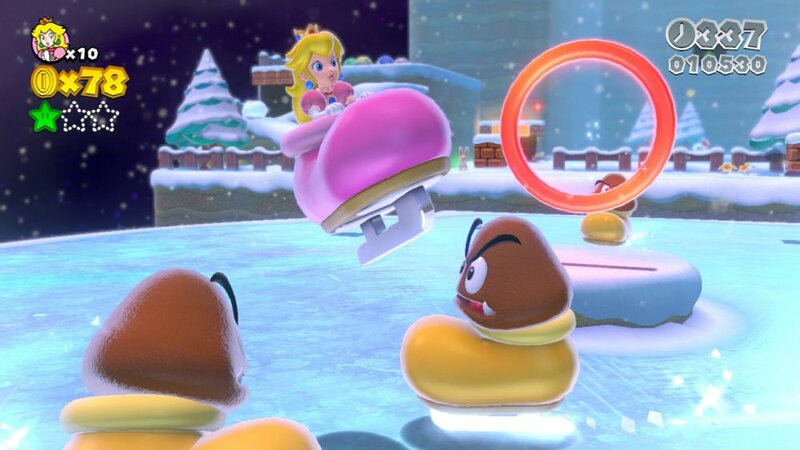 I know, hindsight is 20/20, but Super Mario 3D World is Nintendo at the top of its game, filled with vibrant, creative worlds, an absolutely phenomenal soundtrack, and gorgeous graphics. Unlike most Mario games, 3D World allows you to select a character to play as, and gives you a healthy smack from the Nostalgia Hammer by doing so. 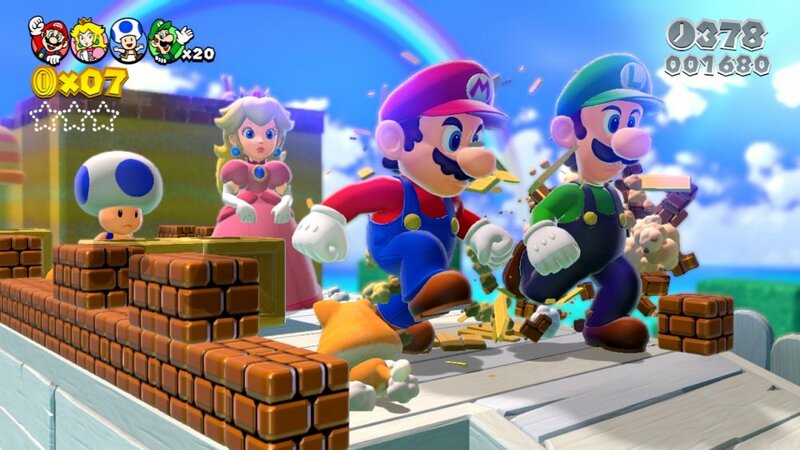 Before any level, you can choose to play as Mario, Luigi, Toad, or Princess Peach, and they retain their special traits from Super Mario Bros. 2 - Mario is your all-rounder, Luigi has the wiggly high jump, Toad runs faster than everybody, and Peach can float. There's even a fifth character you unlock, but I won't ruin the surprise there. It wouldn't be a Mario game without a new power-up or two, and Super Mario 3D World has several. First up, is the obvious one: the Cat Suit. 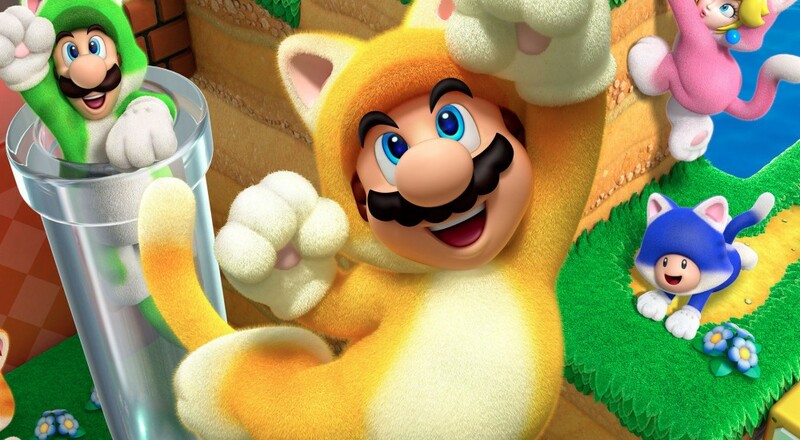 Aside from making (almost) everyone look a little *too* adorable, the Cat Suit lets Mario and Co. climb up walls for a short distance and offers up both a melee attack and aerial dive. Cats can also climb up the flagpole at the end of a level, which is useful, since that's one of the unlockables. Also making an appearance is the fan favorite Kuribo's Shoe, except it's now an ice skate! There's also a Goomba suit that you can wear to sneak around enemies, a Boomerang Bros. suit, and of course, the Tanooki/Tanuki suit as well as the usual arsenal. Recent Mario games haven't doled out wacky power-ups quite as often as 3D World does, so it feels quite fresh. The levels are not quite at Super Mario Galaxy levels of craziness, but they're brilliant nonetheless. Each one is distinctly different, but two really stood out for me. The first is the Super Mario Kart-themed level, complete with the music from Mario Circuit 1. You'll run through the track, gaining speed boosts to try and make successively harder jumps while (power) sliding down ramps and corners. It's a total hoot in co-op. The next that I really loved was the Japanese Castle that you run through, which makes good use of the WiiU's gamepad to open paper walls and bang on gongs found in the scenery. T-Rex would be proud. Speaking of the GamePad, poking at it a bit reveals that you can interact with a lot of pieces of scenery, such as shaking snow off of trees, writing in the sand at a beach, or even blowing on the mic to scatter dandelion seeds to the winds. There's more to be found, but it's a nice surprise, even if the GamePad isn't turning out to be as great as its potential. If the normal slate of levels weren't enough for you, there are a couple extra challenges for you to tackle. First we have the Captain Toad levels, where you take control of... Captain Toad. He can't jump, but you'll need to rotate the world and solve increasingly tricky puzzles to get all the stars in his levels. Next, are the Mystery Houses, where you must complete a series of 10-second challenges to earn Stars. Both make for a nice change of pace. Page created in 0.3377 seconds.